Kathleen from the blog Grosgrain is one of my best friends and is my blogging sidekick. She has helped me out on numerous room makeovers and blog projects over the years, and it was time for me to return the favor! Over the summer, Kathleen’s family joined the multi-generational housing trend and purchased a new home with her mom. Blending two generations with three adults and four kids into one household has innumerable blessings and a few challenges–space and organization being among them. Kathleen’s top priority in the new house has been to carve out personal and combined spaces for everyone. 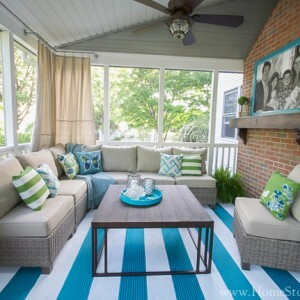 The first project on her makeover list was to create a special space for her mom. 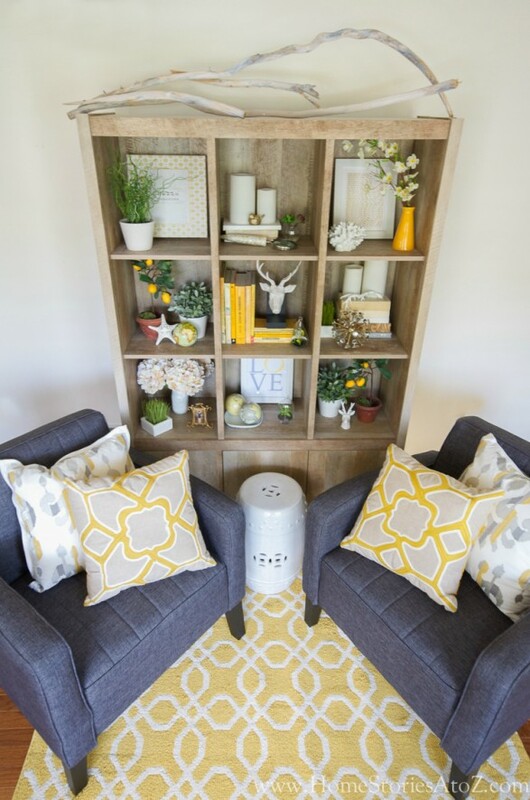 She wanted to give her mom her own sitting room–a place where she can retreat when needed, entertain friends, and have some necessary me time away from the rest of the family. 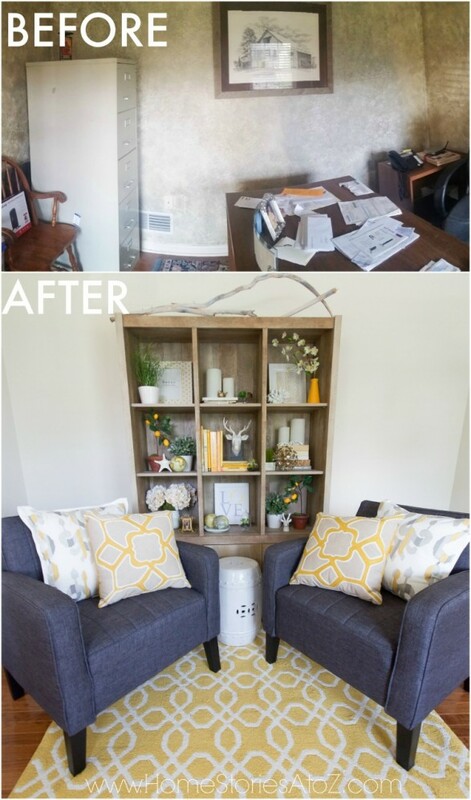 A tiny office at the front of the home was the perfect space for the job and is where I chose to tackle the Sauder “Prepare to Entertain” Room Makeover Challenge! Sauder asked me to pick out a few pieces of furniture for the room makeover which was a challenge indeed! Sauder offers so many sophisticated styles at an affordable price-point that it was difficult to decide. 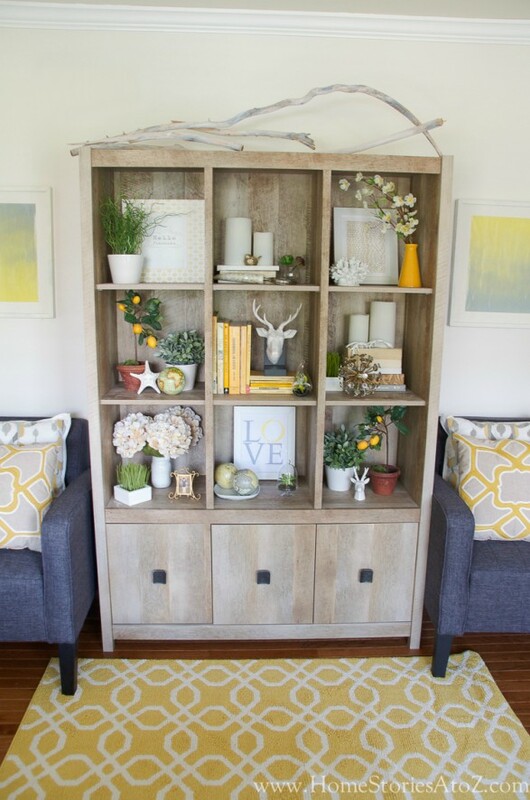 I knew that Kathleen’s mom wanted a bookcase and comfortable furniture for her space. 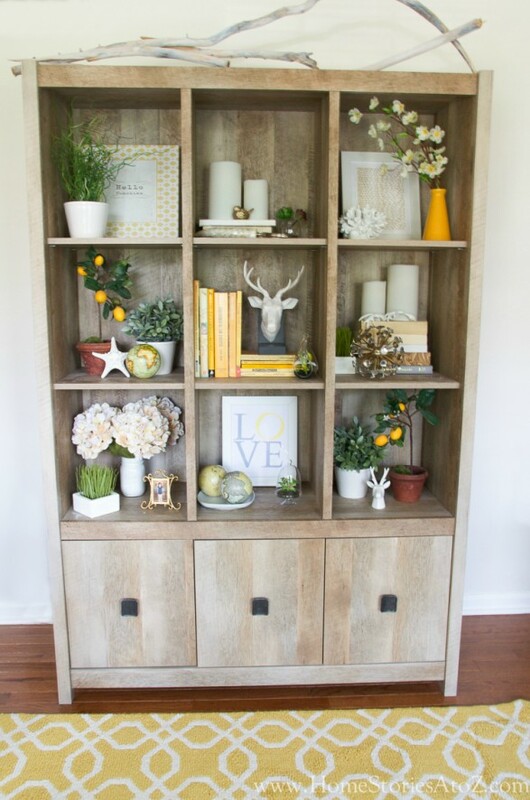 For the main focal point, I chose the Storage Wall which has adjustable shelves for books and accessories as well as hidden storage. 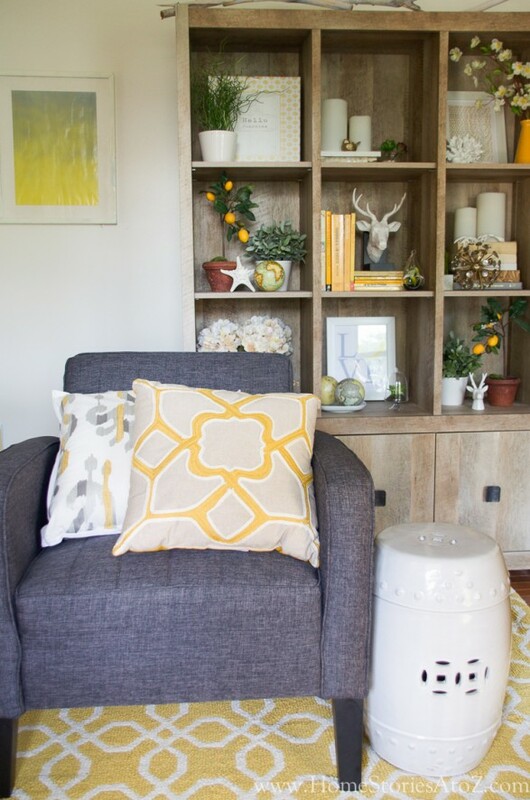 This room is very small and already housed a small sofa and desk, so my goal was to create additional seating and storage that was functional but didn’t clutter the space. I chose two Ellis Accent Chairs that can easily be pushed against the wall when not in use and pulled forward when entertaining. The accent chairs we chose are chic, comfortable and durable. Kathleen has four young children so durability was a necessity! When choosing a color scheme for a space, I often take color-cues from the existing furnishings in the room and the rest of the home. 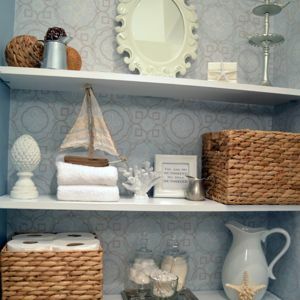 Kathleen had used a lot of grays throughout her space and knew she wanted the room to flow with the rest of the home while also reflecting her mother’s personal taste. We had originally planned on doing a gray and burnt orange color scheme, but as we pursued that direction it felt a bit too contemporary for Kathleen’s mom. 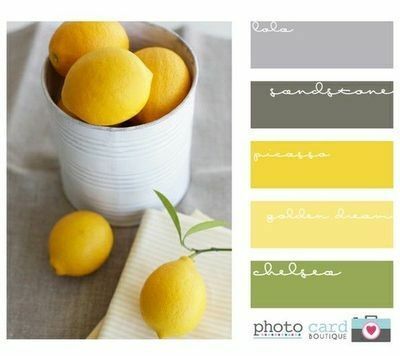 I suggested we instead try a gray, yellow, and green color scheme and all involved loved the idea! A bowl of fresh lemons, a sprig of sage, and a gray linen napkin were the inspiration behind our room design. 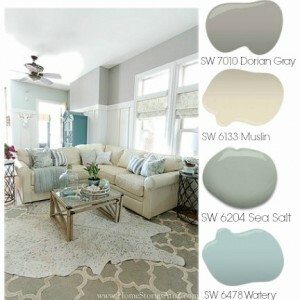 Once we had our color scheme chosen, the room came together very quickly! Before you run out and buy all new accessories, be sure to first “shop the house” to see what you already own that will work in your room. Kathleen and I sorted through her accessories and set aside items that fit within our design plan. This allowed us to easily take an inventory of what items we needed to shop for. 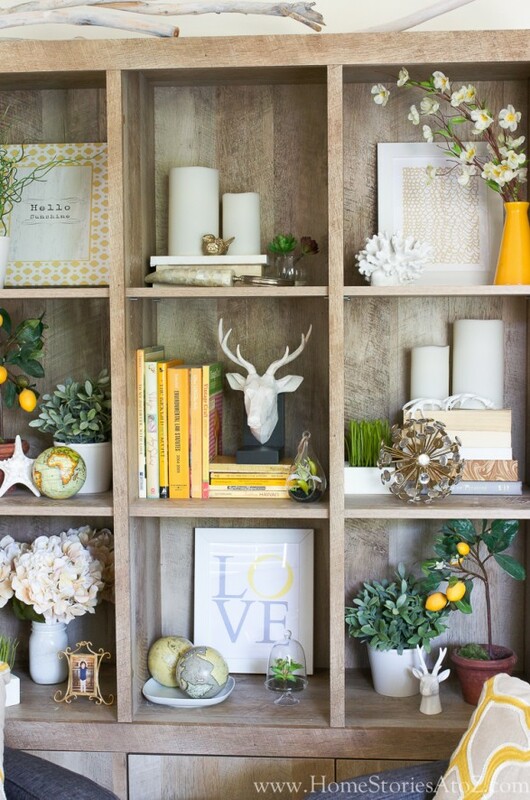 When styling shelves, I always create “visual triangles” using colors within the shelves. For example, in the picture below I have outlined two visual triangles for you. The yellow arrows are connecting three pops of yellow while the white arrows are connecting a few touches of gold. Also notice that I included a touch of green within every single shelf, but I used balance and symmetry when using the heaviest touches of green. 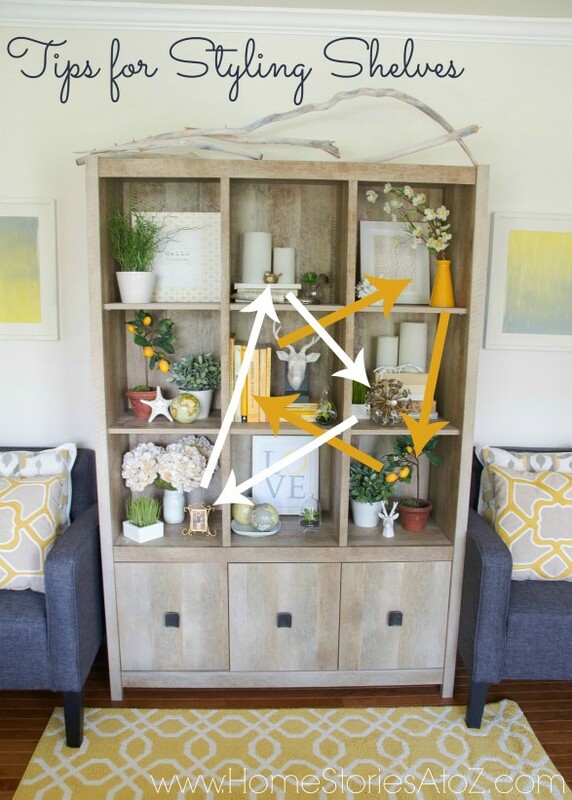 Using the “visual triangle method” is an easy tip for pulling together a cohesive look when styling, but it’s not an exact science. I usually place objects where I think they might look best then stand back and assess my work and then move them all to new spots! Styling is a tiny bit science and a large part art so just have fun with it! The wall on either side of the bookshelf was looking a bit bare so Kathleen went out to her garage and whipped up some spray paint art in less than five minutes! We framed them in some Ikea fames she had on hand and they truly completed the space. 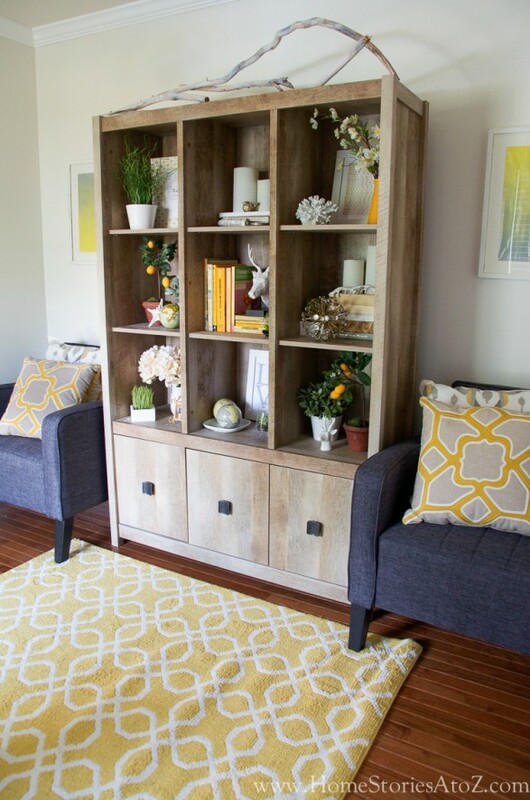 To see how other’s styled their Sauder furniture be sure to check out the Sauder Put Together Lookbook! 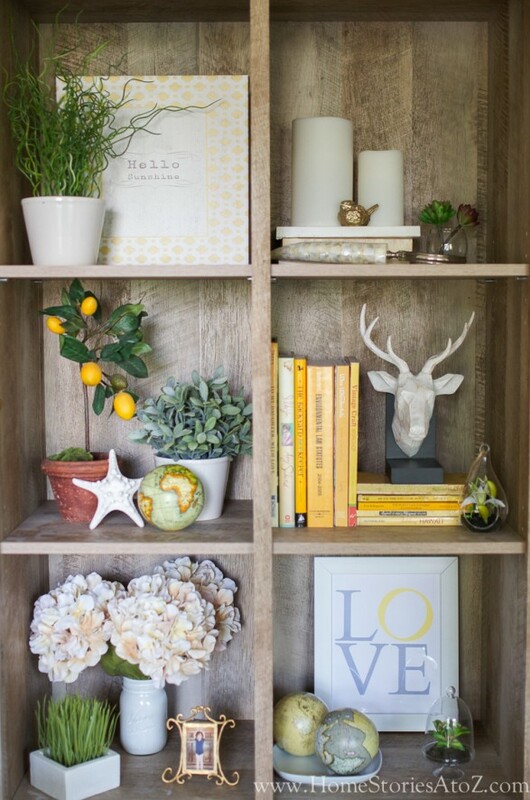 This lookbook features Sauder products styled within real homes. I was looking through it earlier today and saw so many gorgeous and affordable pieces that I liked. 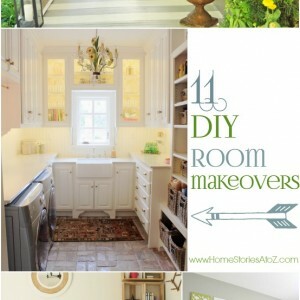 (And bravo to my fellow DIY and design bloggers! I’m inspired by the gorgeous spaces and beautiful photography!) Sauder is frequently releasing new pieces so be sure to follow them on Pinterest, Facebook, and Twitter to stay up to date with all the latest.